The first members of the White Rose were convicted of treason and hanged 74 years ago. The DenkStätte Weiße Rose in LMU’s Main Building commemorates their bravery and sacrifice. Opened 20 years ago, the exhibition has now been redesigned. 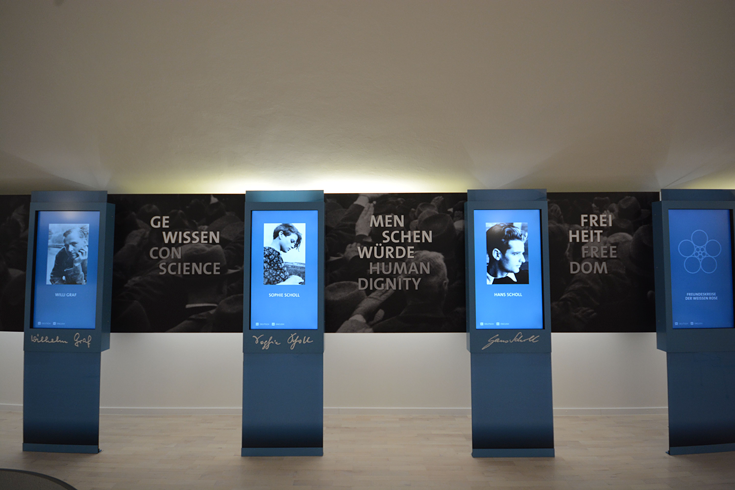 By making visitors empathize with the plight in which the members of the group found themselves, the DenkStätte aims to transmit their values into the present. 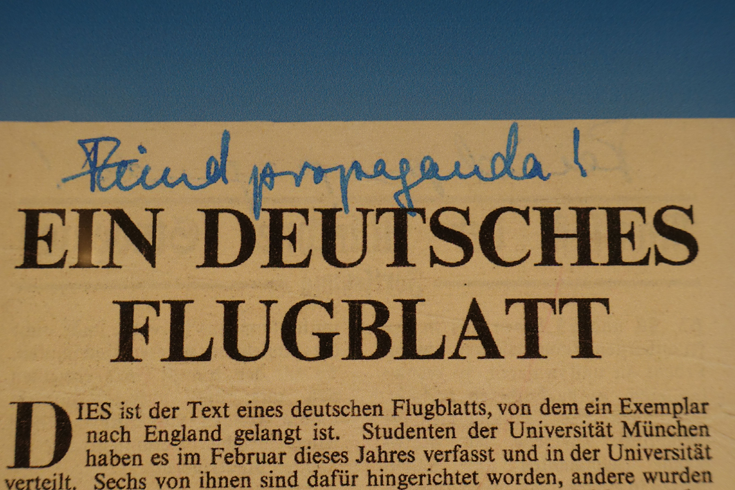 In the sixth of the protest leaflets written and printed by the members of the White Rose - the resistance group initiated by LMU students during the Second World War – they called on their fellow-students to resist the Nazi regime: Students! The German people looks to us! As in the year 1813, when the Napoleonic terror was defeated, so they expect students in 1943 to end National Socialist terror by wielding the weapons of the spirit. Sadly, they failed in their efforts to arouse broad-based popular support for their cause. 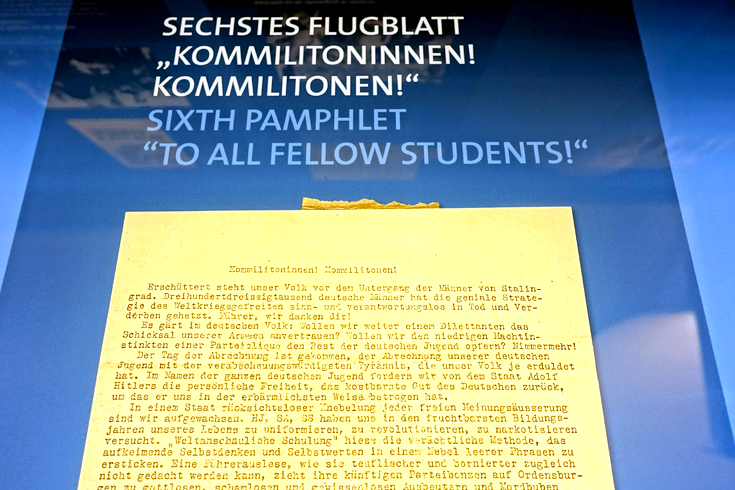 Hans and Sophie Scholl were observed as they left copies of that leaflet at various points around the Main Building, and were subsequently arrested. 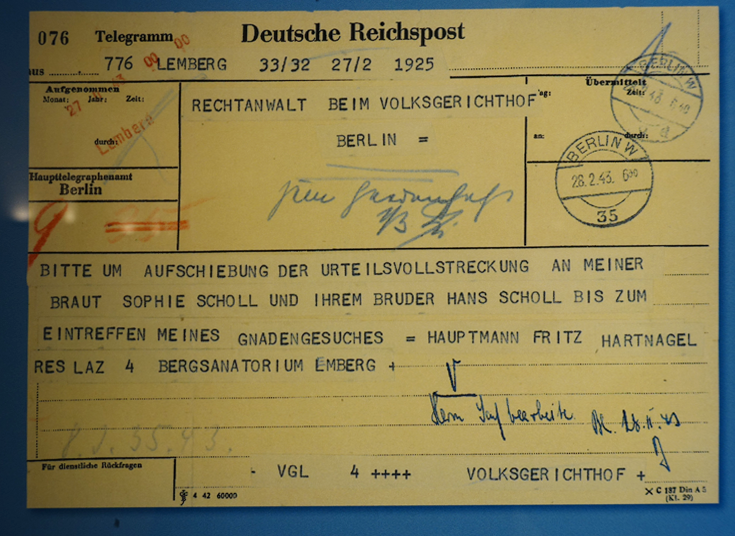 The Scholls, Christoph Probst, Willi Graf, Alexander Schmorell, and Professor Kurt Huber were convicted of treason and executed in 1943, and Hans Leipelt met the same fate in 1945. 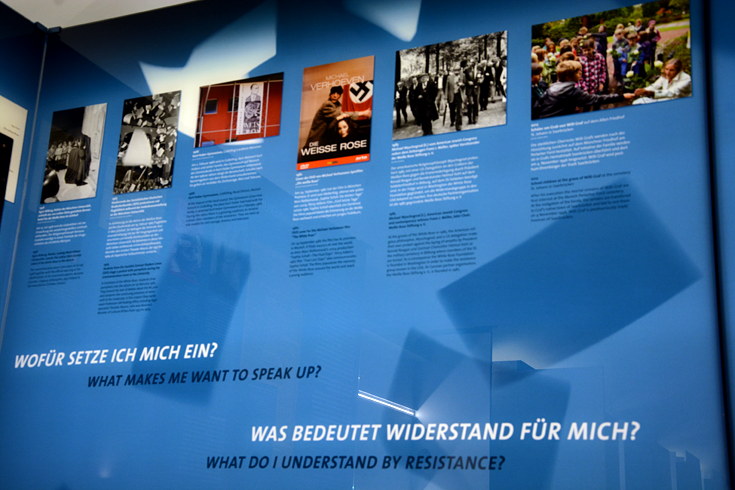 Their story and those of their many comrades who were active all over Germany is documented in the permanent exhibition that has been on display in the DenkStätte Weiße Rose initiated by the White Rose Foundation. 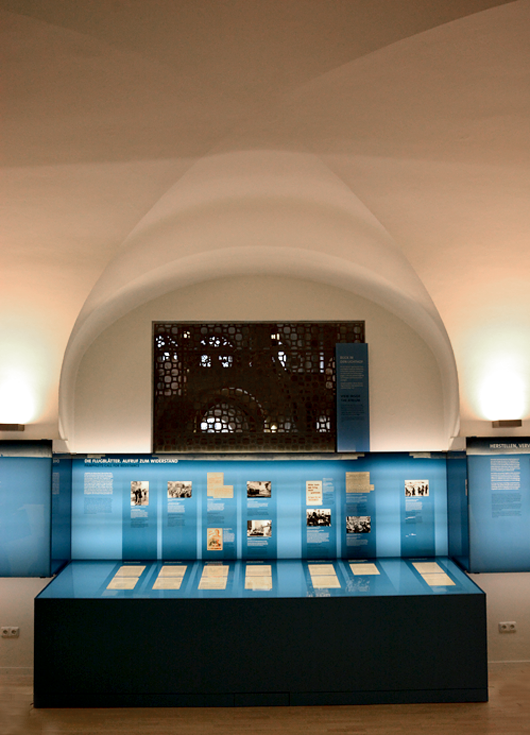 The commemorative exhibition is located in what was once the faculty cloakroom in the Main Building – the very spot where the Scholls were arrested on that fateful morning in February 1943. – Now, 20 years after its inauguration, the exhibition has been reconceived and reconfigured, both in terms of content and with respect to its presentation, and will be open to the public in its new form visitors from next week. Visitors are guided through the new exhibition by a stripe of blue glass. Photos and historical documents illuminate the origins of the White Rose as well as the activities of the group, which extended from the lecture theater to the frontlines of the war. 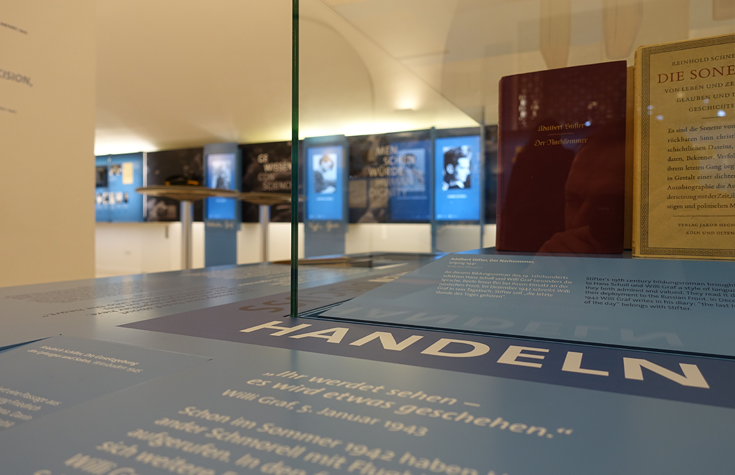 Among the documents on display are the six leaflets they managed to print and the draft version of the seventh and final text, together with exhibits connected with their trials in Munich, which ended in their conviction and execution. Filmed interviews with contemporaries and a documentary feature which outlines how the leaflets were produced and distributed around the country give a vivid impression of the obstacles the young students had to overcome in planning and disseminating their courageous protests. 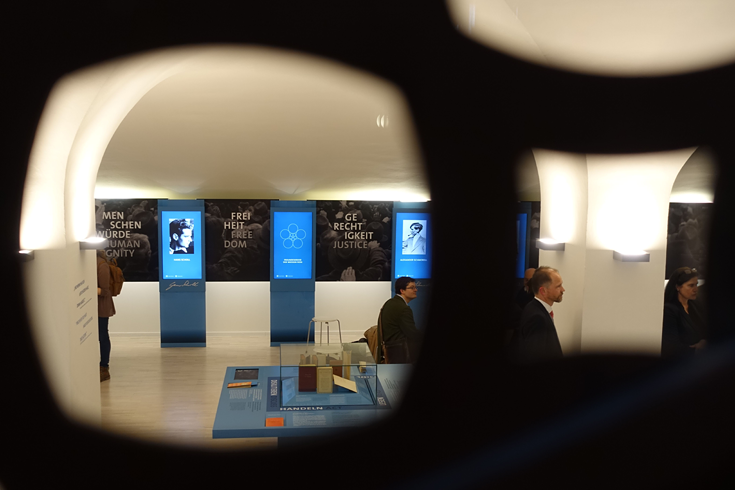 Listening points equipped with headphones provide visitors with an impression of the conditions under which trials for treason were conducted, and the exhibition includes a selection of the philosophical, political and literary works that played such an important role in molding the opinions and moral values of the group’s members. 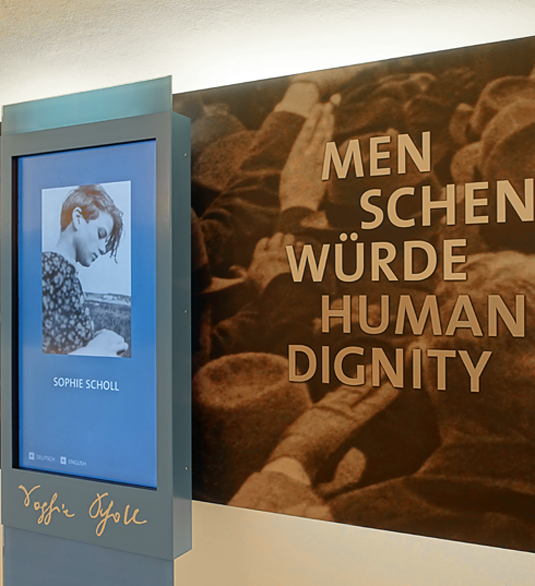 The new concept dispenses with the previous display boards and listening points, which were relocated to the Thomas Mann Hall while the renovation was underway. These had originally been designed as a mobile exhibition some 20 years ago, and were no longer compatible with our contemporary notions of exhibition design. 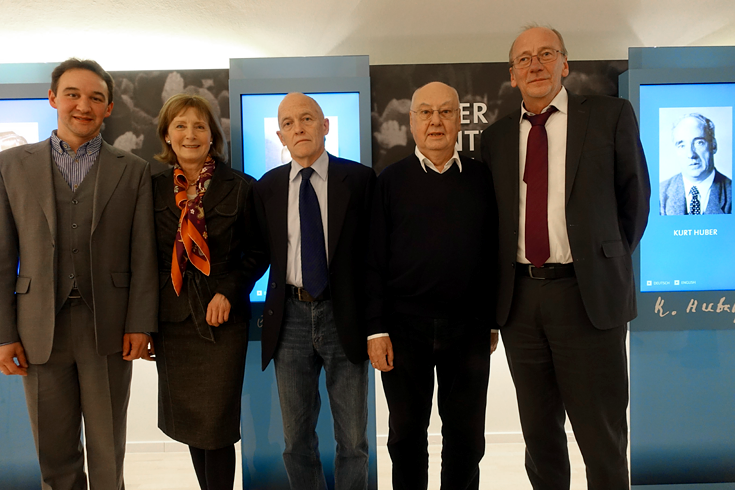 The search for a new approach to the presentation of the permanent exhibition began four years ago, under the auspices of the White Rose Foundation led by its Chairperson Dr. Hildegard Kronawitter. The concept finally chosen was then realized on the site over the last few months. Steps have also been taken to make the DenkStätte easier to find, and an elevator now ensures barrier-free access to the exhibits. In addition, visitors from abroad can now view and experience the exhibition in English. “The exhibition does not attempt to present visitors with any ready answers. 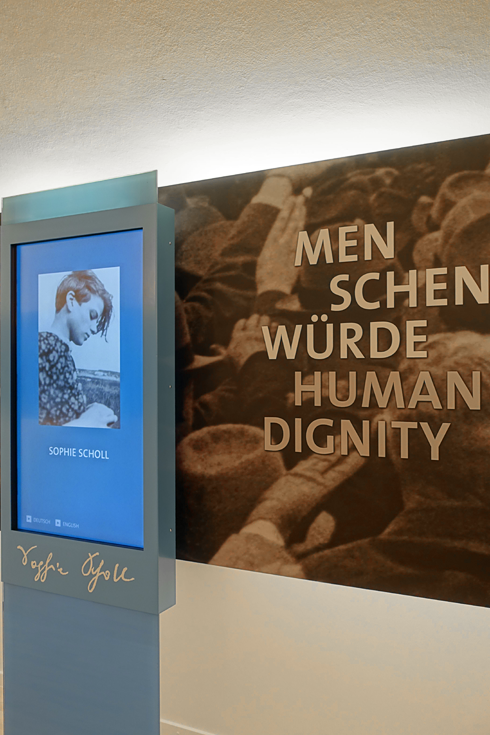 Its purpose is to place the history of the group in the context of the Nazi dictatorship and the vicious war against which it unfolded, and to encourage each visitor to draw his or her own conclusions. 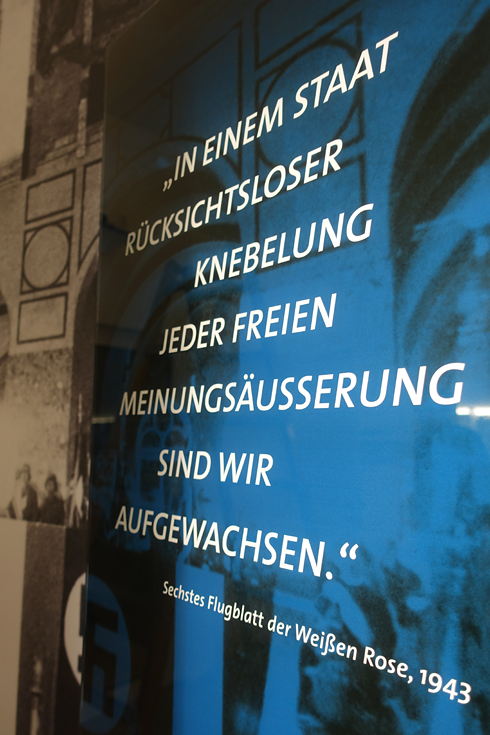 The redesign of the exhibition was financed primarily by the State of Bavaria through the good offices of the Bavarian Center for Political Education, by the City of Munich and by LMU, which covered most of the cost of the renovation of the premises. The White Rose Foundation also contributed to the budget. The entire project was coordinated and carried out by the Foundation, in close cooperation with an Advisory Board made up of delegates appointed by the sponsors, as well as museum specialists and representatives of the families of the resistance group’s members.